SWBAT match numerals to quantities and determine how many objects are in a group. Kids love to count and build puzzles. This activity encourages them to do both! The kids count objects on puzzle pieces and match the groups of objects to the correct number. This lesson is done early in the year and then turned into a center for further counting practice. 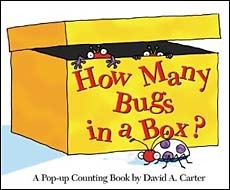 I start the lesson by reading "How Many Bugs in a Box?" We then count to ten on our fingers. Next I play whole group "Grab and Count". That is where I close my eyes and grab as many snap cube counting blocks as I can with one hand. We count them into a tower. This reinforces one to one counting skills. Then I show the kids one of the puzzle pieces. We count how many objects are on it. I then find the matching number and put the pieces together making a match. I promise to keep my hands in my lap until the teacher says it's okay to take out the puzzle pieces. I promise to share nicely. I promise to respect our classroom tools (instead of chewing, throwing or breaking the puzzle pieces). I promise to use my time wisely. I then place set of puzzle pieces on each table. I bought mine at Ross. They were very inexpensive. They can be hand made with card stock as well. I tell the table captains that they were allowed to open the box and lay out the pieces. The box is put on the floor away from the tables. I tell the students that they must keep the pieces in the middle of the table so everyone can see and reach all the pieces when they need them. To signal the start of the building I say, "Begin!" in a very enthusiastic voice. While the kids play (match) numbers and quantities I roam the room to look for counting strategies that I might want to have a student demonstrate during closure. When I see one, I pull the student to the side and ask them if they would mind showing the class, after we finished the activity, how they kept track of the objects they were counting. The exit ticket for this lesson is the completed puzzle matching game. I roam the room to make sure the kids are counting accurately and are not overly challenged. I never want to take them to the point of frustration, only challenge. Once the table teams are finished matching numbers to quantities I go to each table and check to see if the matching has been done correctly. If I have any concerns with any of the kids, I meet with them for a 3-5-minute one on one intervention. **The number cards in the resource section can be copied on card stock and cut to make puzzle pieces. Print each set on a different color card stock for easy management of supplies. We gather on the floor and discuss our counting strategies. I choose a few kids to come up and demonstrate their counting strategy on chart paper (I have objects in scattered arrangements already on the chart paper - large stickers is a quick way to create this). **This is the most important part of the lesson because it allows me to see who conceptually understands what they are being asked to do when asked to count. I have several students who can rote count, but struggle with one to one correspondence and organization when counting. They will count the same objects over and over or they will skip over some. A few of my students even count while randomly touching objects. There is no real meaning or correlation between their oral counting skills and the need to determine quantity. Having the students demonstrate their strategies while counting helps the others learn how to track their counting and find meaning in one to one correspondence.